Some of these plans are also suitable for adaption to sail or motor. If you need help with lofting out the plans click here for an article, which should help. It folds to a compact flat bundle that may be stowed aboard any cruiser, auto, airplane, loaded on a donkey, or easily carried to point of destination. It is suitable for those hard-to-reach places where conventional or rigid boats are difficult or impossible to transport or where boats are not available. Its marine plywood construction makes for easy and strong fabrication. Junior is a type of boat usually known as a yacht dinghy or tender, but there the comparison ends. 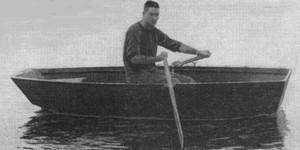 Yacht dinghies are notoriously cranky and hard to row, but Junior is of such ample dimensions and so carefully designed that it rows quite easily, carries three and even four adults propels well with small outboard motors, and could even be sailed, if fitted out with simple sailing equipment. Last but not least, Junior makes an excellent car top boat for fishing or hunting anywhere, since it is lightweight, leak-proof and easily handled afloat or ashore. Jolly Roger —shades of Captain J Kidd and Morgan. Here is ia small boat for big or little adventurers easily built of flat bottom design for those small tars who thirst for high adventure on a pond where the sunfish lurk. Despite its small size the Jolly Roger also makes an excellent yacht dinghy for father. 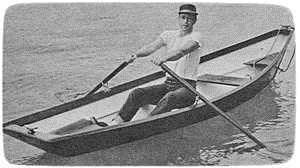 Rowing boat plan and construction is conventional, but easy. Cork is a real fisherman’s boat. 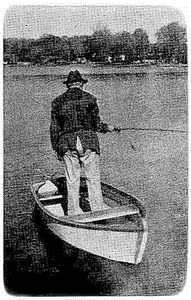 Cork has end seats just the right distance apart for two anglers to face each other (so one can see what the other is doing) and for one to help the other net a fish, untangle a plug that may have snagged a line, or quickly shift oars if a fish requires it. Cork handles so nicely because of her V-bottom (scow ends are identical). In fact, she’s a dream to row in either direction, from either seat. There’s plenty of buoyancy for three adults, and for one occupant the center seat is just right to row from, using either pair of oar locks. Here’s a free rowing boat boat plan for a sturdy, lightweight, fishing dinghy you’ve been looking for. The frame is encased in fibre glass, thus making each frame member a rectangular beam, and the color goes all the way through so you’ll have no hull painting problems. Between the hull’s interior and exterior layers of fiber glass is a layer of 3rin. fiber-glass mat, the whole bonded together with polyester resin to give you a sturdy, leak-proof, lightweight boat. For safety’s sake, air chambers built into each seat give approximately 3000 cu. in. of air space within the hull. 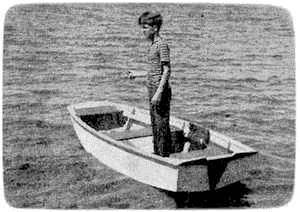 When the soft southerly breezes blowing on your fevered brow and the moist, salty tang of marshes tingling in your nostrils make you long to get out on the water, then, Brother, the bug has bitten you and it’s time to think about building a boat. Chessy is just the ticket to get you acquainted with the sport. She is strongly built so she’ll take a beating when you drag her up on sandy beaches or push her into marsh grass with its inevitable hidden snags and roots. She has plenty of flare, which will keep her dry when the going gets rough—and she is steady enough on her keel to enable the soft-crabber to stand in her bow and reach for a fast moving crustacean without having the feel ing of walking a tightrope. If you’re a lake fisherman who likes frequent changes of scenery, this light weight car-top boat will permit you to drop a line in any body of water to which your car is able to transport you. Or if a non-fisherman who just likes to spend an occasional day on the water, your radius of, enjoyment will be expanded well beyond its present limits. 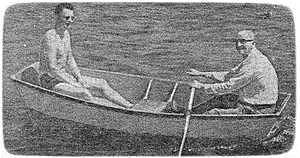 Although an ideal two-person boat, the semi-V bottom and pram type construction make possible the accommodation of three individuals without swamping. 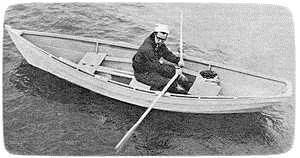 This universal flat bottom rowboat is one of the most versatile craft that can be built. It’s simple, inexpensive construction and substantial design make this free rowing boat plan a safe boat for sport or recreation anywhere. It is especially well adapted to easy construction and is designed to be built from 14-foot lumber normally available almost anywhere. Easily rowed or propelled by small outboard motors from 1 to 6hp. It is seaworthy and stable on any waters and has the capacity of much larger boats. 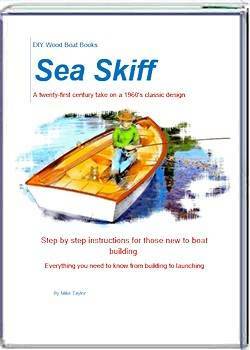 Sea Skiff is quickly built over forms for construction of one or for several boats. It is planked with waterproof plywood and will retain its leak-proof qualities even if left to dry in the sun for long periods. An ingenious method of framing makes for a sturdy boat and provides a hull that will give many years of trouble-free service. 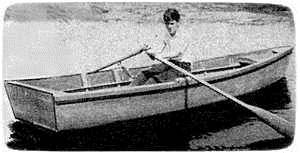 The general rowing boat plan presents a sturdy skiff that may be used on any waters anywhere. 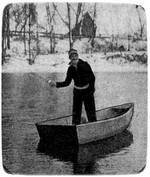 The boat may be rowed, powered with air-cooled inboard motors or outboard engines, or rigged for sailing. As a sailer it is dry, light, and fast in a good breeze. Designed with a convex bottom for maximum speed whether powered by sail, outboard motor or oars, Sea Midge is modelled on an Old World boat originally developed as a yacht dinghy for use upon the North Sea. It is an excellent all-around work horse and is light enough to be carried anywhere. 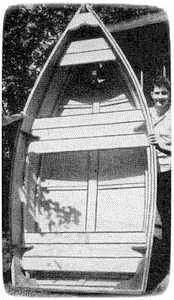 Rowing boat plans and construction of Sea Midge are simplicity itself. This dory just as sweet a rower—and not as fussy to build as you might suppose. Build her as a utility boat, as a tender, as a silent sneak-up on-’em fishing skiff, as a trainer and fun-boat for the kids—or just as a conversation piece. The first time you take her out you’ll be flabbergasted at how easily she darts along with light pulls on the oars. Of course, she can also be sculled, using a single oar stuck through a hole in the transom and wiggled back and forth with a certain twist of the wrist. This gives a narrow rig that can sneak between moored boats and dock piles like an eel. And as a bonus, she can be sailed, she’s just the right size and width to do well with the rig from a sailing surf board or dinghy—say something between 45 and 65 sq. ft. area. This modernized version of the pram is perhaps the most versatile Free Rowing Boat Plan that may be found. It rows easily, sails well, and propels nicely with a small outboard motor. It weighs only 90-100 ll. and therefore is easily handled and carried atop any auto for sport and adventure limited only by road maps. It is wide beamed and due to the commodious design its capacity is the equal of much larger boats. This pram will safely seat three persons. 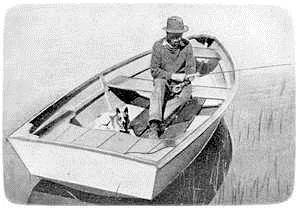 This dory is a natural for the man who likes a bit of exercise and appreciates the simplicity and silence of a well-designed rowboat. A narrow bottom, tapered at both ends, enables her to slice through the water with a minimum of effort and flaring sides make her safe and dry in a chop. 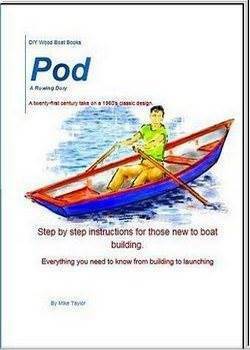 Pod, has a beam of 52in and an overall length of 15ft, 5in. Three pieces of marine plywood make up the sides and bottom and no frames are required. This rowing boat plan makes boatbuilding about as simple as it ever gets and the result is a light, clean hull with fewer places for rot to develop. However, for those who feel better with conventional framing, optional frames are included in the drawings.